A true odyssey of romance, adventure, courage, friendships, determination and the medical miracle of life-saving organ transplantation. Racing Against Time is the ‘against all odds’ story of one man's battle with progressive liver disease, and the perseverance to survive despite seemingly ever mounting obstacles. 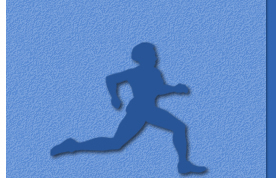 Diagnosed as having less than five years to live, and in the face of that bleak scenario, Antony Anjoubault continued to run road races despite broken ribs, vertebrae fractures (osteoporosis), internal bleeding, and increasing fatigue. This true story relates the tale of Tony’s ‘act of fortitude’ in “doing whatever it takes” to overcome disease and the tender love story of his wife, Anita, who walked beside him throughout all the setbacks/trials, sustaining each other, until the miracle gift from a liver donor was bestowed. Tony’s saga serves as an inspiration to anyone facing a challenging debilitating chronic or terminal illness; especially for those awaiting organ transplantation. Jim Nabors, famed actor and world-renowned singer, was stricken with chronic hepatitis, and as the clock struck midnight, he received a liver transplant during the mid-90’s. 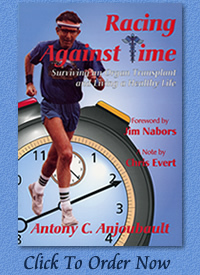 Having experience the same struggle to survive, Nabors was inspired by Tony's story to contribute the Foreword to Racing Against Time. [read now] On countless occasions, he has lent his great talent to elevating organ donor awareness, raising vital funds, to this most pressing crisis of organ shortages. Today, Tony and Anita continue to share their first-hand knowledge and hope to those awaiting transplantation. The couple stress, the urgent need for public awareness of both the extreme shortage of donor organs and also the blessed miracle of the gift of life. After all, as the author underscores daily, we are members of the same community of mankind. An uplifting and inspiring story of the triumph of the human spirit! design & web work ©2008-2015, Creative Office Solutions ~wildeoffice, all rights reserved.